Nothing says German winemaking like, "Dr. Pauly-Bergweiler." Dr. Pauly is actually owned by Dr. agr. Peter Pauly. While D.P. 's, "Noble House" may not be this winery's top offering, it does however make for a fine introduction to the racy-semi-sweet style typical of many good German Rieslings. Noble House offers what many value-priced wine from Deutschland lack: Harmony and balance between acidity and sugar. Sure this wine is slightly off-dry. However, its bright acidity livens things up, and conveys fresh, rather than overripe peach & pear character. Give the 2005 vintage of Pauly-Bergweiler Noble House a spin alongside tuna or chicken salad (we can still dream of picnic weather can't we?). It's ten bucks well spent. Georg Breuer Spätburgunder (Pinot Noir), 2004 ($20) - imported by Classical Wines. Surprise! An excellent quality red wine from Germany's Rheingau region. In a region - nee a country - known for racy Riesling, good old Georg puts his teutonic touch on Burgundy's grape. And the result is one of the zestiest white-wine-in-red-wine-clothing you'll ever taste. This Pinot is damn near coral in color - more a dark rose than a red wine. It offers up scents of just-ripe strawberry, tart cherry and woody spice. In the mouth, Breuer's Spätburgunder possesses nearly invisible tannins; making for a sheer, silky mouthfeel. It imparts flavors of red raspberry and cherry, followed by a delicate finish. This wine is definitely for the fragile wine lover. Don't clobber it with food. Try Breuer's Pinot with roasted chicken, fresh goat cheese or sashimi. 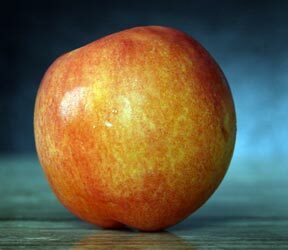 This wine begins with flavors & scents of fresh nectarine.. 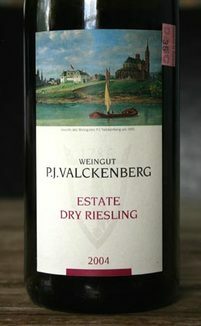 It quickly develops crisp, lemony-citrus flavors..
Valckenberg, while dry, finishes off with distinct honey notes..
A fine tasting dry German Riesling at a great price.. The Caveman has been dealing with the dilemma of pairing wine with ham. "The Ham in question is a smoked shoulder, pricked with cloves and cooked in a mix of beer, onion and molasses. The meat is red and smoky, rich and fleshy with an obvious touch of sweetness. This would theoretically lend itself to a ripe new world red, however, the salt factor has always proved to be the bug in the system, turning the softest tannin into iodine. And the powerful flavors have always seemed a bit overbearing." 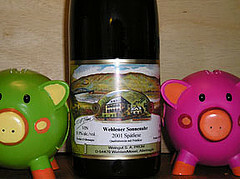 To distill his sentiments into impish Dr. Seuss-isms, I present, "Big Reds and Ham"
He actually recommends a tasty Spätlese German Riesling (Wehlener Sonnenuhr 2001 from S.A. Prüm). I'm not sure I'll be able to build a string of rhymes based on "Spätlese Riesling and ham." Mosel = green; Rheingau, Rheinhessen and Pfalz = brown; And from the Nahe region = of course, blue." "Clad in the traditional dark-blue Mosel bottle, this is perkier than the standard mosels from this spot, due to the superior riesling grapes in the blend"
"The color of a bottle of German wine telegraphs whether the wine is from the Rhine River valley (brown) or the Mosel (green)"
Let me get this straight. Mosel bottles are traditionally green or blue? However, Saint M, from the Pfalz is blue. And aren't Pfalz Rieslings supposedly clad in brown glass? Perhaps Saint M's blue glass is designed to stand out from the crowd (it worked, I purchased a bottle). Not that this is terribly important; however, I would like to know, if there are indeed traditional glass colors for Germany's wine regions. If you are a German wine lover with this bit of trivia lying in your brain, please enlighten me. And, while we're on the topic of German wine bottles, can you tell me what's up with the Bochsbeutel? A few days ago I was perusing the surprisingly rich German wine collection in my local wine shop (Keep in mind we’re talking Utah’s alcohol monopoly. So by surprising, I mean approximately 20 different German wines). For kicks I like to keep tabs on the entry level stock - the stuff that costs between ten and fifteen bucks. The reason? Well, when German wine newbies come to this particular store, they quickly learn that their beloved eight-buck ‘Peezportur’ and ‘Bloo None’ aren’t sold here. This is the one shop in town that doesn’t sell lower end sugary Ries-plonk (at least from Germany, anyway). In the past, those brave enough to expand their German wine horizons likely stepped up to ten-dollar Dr. Pauly or thirteen-buck Dr. L. However, these selections are no longer available. 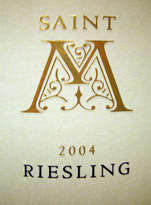 In their stead appeared the slightly enigmatic “Saint M.” My curiosity got the best of me and I took the Saint home. Still, what is it about the bottle that’s so damn familiar? Stay tuned. "Augustus! Stop eating your fingers." "But I taste so good." Think of Schloss Saarstein's Pinot Blanc as a soft, slightly chubby expression of the white Pinot mutant clone (known locally as Weissburgunder). This wine, imported by the fine Volks at Valckenberg, is one of the few German non-Rieslings I've seen in my neck of the woods. I was on a veggie kick when I sampled the Schloss, and it paired quite well with roasted Swiss chard and sautéed baby red potatoes in garlic & butter. I recommend keeping your foods firmly in the salty/savory camp with this wein. Otherwise the sweetness might be a bit much. If you see S. Saarstein Pinot Blanc for $15 or so, grab it. I think $20 is too high. Introducing a new category, "from the cave," by wine blogger extraordinaire, "The Caveman." Some of Bill's work will be cross-posted here, a few pieces will be posted here exlusively, while other posts will be found on the Caveman's Wine Blog. I make no bones about it, I love German Riesling. If I win the lotto my first ridiculous expenditure will be to add the Mosel tap right next to the Hot and Cold. 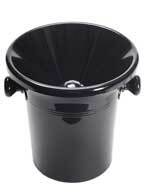 I asked one of my confreres cavistes if he had tasted anything great from Germany recently. He smiled and said all of it. There exists an incredible consistency amongst the better winemakers in the region. In the best examples there is a naturally razor-sharp tension between acidity and richness, minerality and fruit. After a difficult 2003 vintage where the razor was definitely dulled and the Rieslings were too rich, it was a pleasure to taste a couple of classic 2004’s where words like aerian, fresh, steely and opulent could be tossed between smiles. Damn do they drink well.